Ford Rangers appeared with a reverse cut Dana 28 TTB (Twin Traction Beam) 4WD front axle in 1983. In 1990, Ford Introduced a 4.0L V6 to its engine lineup, and along came the larger Dana 35 axle to handle the increase in power. The Dana 28 didn’t completely go away though. A version of it found its way in to the 1990-1997 Ford Aerostar AWD mini-vans. It also found it’s way back in to the 4-cylinder (and some 3.0L V6) Ford Rangers from 1993-1997. The 1993-1997 Rangers can be deceiving. 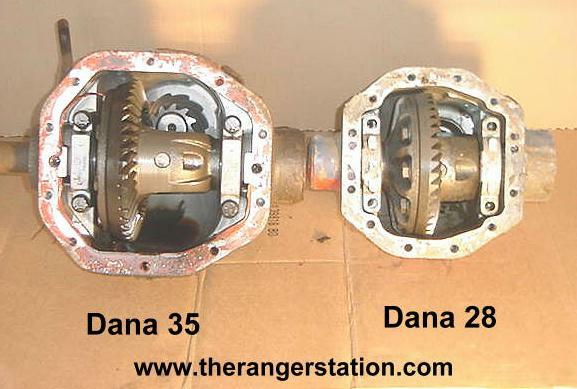 Some owners believe they automatically have a Dana 35 because they have a 1990 or newer Ford Ranger. Although their 1993-1997 4-cylinder Ranger may look like it has a Dana 35, it may really be a Dana 35 axle beam using a special housing, and Dana 28 components. These Dana 35’s are commonly referred to as ‘Hybrids’. In 1998, the Ford Ranger went to a Dana 35 SLA front axle. 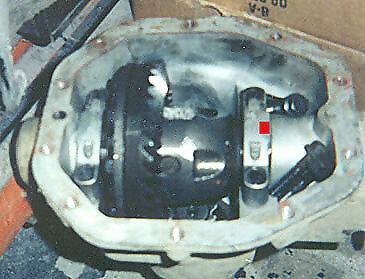 The Dana 35 SLA switched from a reverse rotation gear to standard rotation gear. The gears in a 1997 and older Ranger/Explorer will not work in the 1998 and newer Rangers. 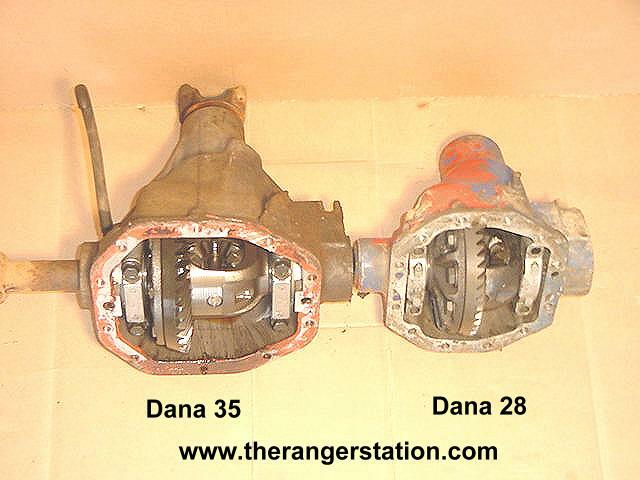 The below photos show the visual differences between the Dana 28 and Dana 35. (For more information on breaking down codes, click HERE. Since the Dana 28’s were built in the 1980’s, their code will start with an ‘E’ where as the Dana 35’s were built in the 1990’s and will start with an ‘F’. The above mentioned code would indicate that the axle was a Ranger axle built in 1991. There is a manufacturers label on the back side of the right axle beam that lists the year manufactured and gear ratio. The second box from top right identifies it as having 3.73 gears. These stickers are on the back side of the passenger side axle beam. Here is a picture of a Dana 28 & Dana 35 driver side axle shaft with the dimensions shown. Here’s a picture of a Dana 35 (Left) and Dana 28 (Right) spindle with dimensions shown. The easiest way to check to see if your Dana 35, has Dana 28 “Guts”, is to pull the fill plug out from the front. If you can see the main cap (above), you have the Dana 28 guts (Sorry!). If you can see the end of the carrier (below), you have “The Real Thing”. If you look at the photos above of the carriers internals, you’ll see a red dot. This marks the location of what you will see through the “Plug”. In the above (2) photos on the left it shows a Dana 35 hybrid that houses the Dana 28 carrier/gears. Note that the housing has a smooth surface. 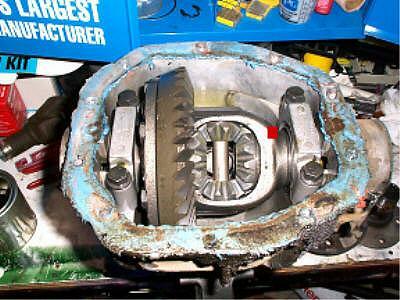 In the (2) photo’s on the right you’ll see a true Dana 35 differential. Note how the case in the far right photo is ribbed for strength. Are the Dana 35 “hybrid” axles with the Dana 28 guts.